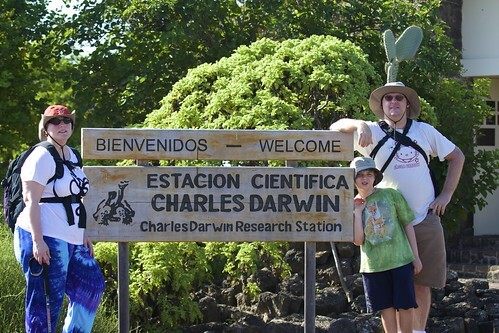 Roger, Christine and I spent one week of April 2010 in the Galapagos Islands on board the National Geographic Endeavor, a vessel in the fleet of Lindblad Expeditions and the National Geographic Society. While the Endeavor is definitely a luxurious cruise, featuring great food, fully climate controlled interior (the ship spends part of the year in the arctic/antarctic), spa service, and all other services you might expect in a fine resort, this was no trip of relaxation and total disconnect. Every day was filled with opportunities for hiking on or snorkeling around the various islands of the Galapagos archipelago. If you so chose (and I did! ), every day was filled with opportunities to get up close and personal with all of the unique life of the Galapagos. And it wasn’t just a sightseeing tour. The staff included seven naturalists deeply versed in the wildlife, geology and history of the Galapagos who patiently answered all questions and offered deep explanations and observations of the islands and all wildlife therein. The itinerary covered many of the islands and quite a few islets in the Galapagos. Itinerary details are below and will be filled with details and links as I write up each entry across quite a few upcoming blog posts. Throughout the itinerary, hyperlinks will be to various posts on the weblog and to flickr photo galleries. All photos are available in this flickr photo gallery or you can see them on this map. We arrived in Baltra, Galapagos in the AM, were welcomed to the good ship Endeavor and then spent the afternoon walking amongst the birds and critters of North Seymour island. We spent the morning hiking on Española Island, observing many of the creatures unique to the Galapagos and, even, unique to this particular island. While we did go snorkeling in the afternoon, I really didn’t catch my underwater photography stride until the next day. The full impact — the stunning uniqueness — of the Galapagos became quite apparent on this day. It was often a challenge to avoid tripping over the critters and a number of them showed curiosity in us, too. As well, we spent time on a truly stunning set of cliffs along the coast. We spent the morning deep water snorkeling around Champion Island. While my underwater camera actually worked this time (battery died four pictures in on the previous day), I hadn’t yet really hit my stride with underwater photography (not sure I ever really did). The waters were warm and would have been very clear — no sediment — if it wasn’t for the near clouds of biomass in the ocean currents. After lunch, we did some beach-walking and then a hike near Cormorant Point. Lots of creatures, including passing by a flock of greater flamingos. While beach-walking, I also spent some quality time with a brown pelican, taking many photos and generally admiring an incredible creature. Bright and early, we crossed the equator while southward bound to our first destination. Just prior to crossing, we passed through huge schools of dolphin and had a bit of fun during the crossing itself. During the morning, we took a zodiac cruise along the shore of Isabela Island, followed by some incredible snorkeling. The afternoon was spent at Punta Espinosa of Fernandina Island, hiking amongst marine iguanas across ropy lava. This entry was posted on Friday, April 30th, 2010 at 11:38 am	and is filed under Travel. You can follow any responses to this entry through the RSS 2.0 feed. You can leave a response, or trackback from your own site. Can’t wait to see what we have in store. Thanks for doing this! I hope everyone had an uneventful trip home. I didn’t lose my “buddy”, Scott. I don’t think he’s going to live that episode down. I wish you had a picture of me meeting up with him after being lost at sea!